I wrote a novel last year, and last month I published it. Some authors fill in this space with details of euphoria, the wonder of seeing their name in written print, and the blissful ease of spouting off 85,000 words that needed no refining or editing. I feel those things. It's great (besides the editing thing—every writer needs an editor, whether they think so or not). It was also hard. Very hard. It was Saturday after Saturday crouching over my keyboard, watching the blue sky darken and imagining it was the last sunny day of fall that would happen in my lifetime. It was night after night of frustration, pre-occupation, and contemplation, as I lived in two worlds—one that I can do nothing to control, and the other that is subject to my every whim. Balancing the two realities is like trying to paint a landscape while holding a seat atop a bucking mustang (the horse, not the car). It was person after person coming back with my manuscript and telling me to "change this," "re-write this section," and "make this part better because it's not good enough," subjecting my already fragile ego to the whims of critics who, I worked to convince myself, actually knew what they were talking about. In the sweetness of post-published, it's easy to forget the hard parts in the delight of my name on the cover of a book. In the uphill trudge of self-marketing, I remember it again. Having published, I'm now marketing. Yesterday I emailed almost a dozen influential people, introducing myself, asking to guest post on their blogs, asking them to read and perhaps review my book. So far, everyone has said no. Although to my practical mind, this makes sense (influential people are busy, or something like that), to my ego it's a gentle reminder that none of them need any favors from me. Mine is the small platform, the new book, the person that no one has heard of. Mine is also the vision, the goals, the desire to work hard to do what I believe in, to make a difference, to foster and help my novel grow, because I wrote it and I stand behind it. It's not easy. But I think someday I'll look back and acknowledge that it was all worth it. At least, that's what I'm hoping. Here's a link to my book. Check it out, maybe buy it, and write a review on amazon! And thanks for reading what I have to say so faithfully. Everybody likes anonymous surveys. There is all of the freedom of expressing opinion, and none of the burden of disagreement. It lets you say what you think without giving a reason. Great, right? Maybe not. Maybe it's a good thing to take responsibility for your thoughts and ideas, and to stand for something. Signing your work means setting aside your fear of argument, your fear of being made fun of, your fear of being judged in the future. Why are we afraid? We're afraid of what people think of us, because even though we're not in elementary school anymore, the pressure of fitting in is weighty. We're afraid of what our bosses will think, our colleagues, our friends, our mom or grandma. We've been conditioned to think that it's admirable not to stand for anything, because then we're giving everyone a fair shot at happiness. Sometimes it's really hard to put more than two words together and come up with something meaningful. The self-imposed pressure to do something that matters takes a deadly toll on already feeble inspiration, and it's gloomy and raining outside and I don't want to walk home to lunch. This morning I ran to then on a track. As soon as I got there, I saw the old man running back and forth, about a half length of one of the long sides of the track. I would round the last curve of the track, and he would be running towards me full speed (for him, at least), teetering on his old legs, swaying back and forth at a mesmerizing (and concerning) pitch. As I got closer I started to move over on the track so we wouldn't collide, but right before I reached him he abruptly turned around and ran the other way. I passed him and kept going, and the scenario repeated itself as many times as I circled the track. I spent my run thankful that my knees didn't hurt, and thinking about why that man, who had the whole track to run around, was using only a tiny section. I saw the bicycle on my first lap around, but didn't put it together until the third or fourth lap. He was running that short piece of track to babysit his bike, which was standing tall and proud on a kickstand next to the fence. And he had a bike lock on his bike, unused, and a coat draped over it, like the covering of a proud and chilly racehorse. He was running his short laps to watch his bike, and although I tend to shy away from philosophics (which is not a real word), I wondered why he wasn't using the lock, instead running 30 yards back and forth to watch it. Maybe the dark had something to do with it, maybe it was an expensive bike (I didn't stop to look at it, after all, he was right there), maybe it was actually a trap and he wasn't as feeble as he appeared to be, maybe it wasn't his bike at all and he just really likes running 40 paces back and forth. And back and forth. And back and forth. And back and... You get it. It really doesn't matter very much, but it made an impression on me, and hours later, I'm sitting at my desk, glad that the rain didn't ruin my shoes on my walk home for lunch, and thinking about that guy who just kept running back and forth. Write about what makes an impression on you. Maybe someday you'll realize it mattered more than you thought. At some point in your life (hopefully sooner than later), some wise person likely sat you down and told you not to entertain the 'What if's.' They're a lousy bunch of mental guests, always coming before the party is ready, and overstaying their welcome. They track mud in at the door (even when it's not raining), eat all the biggest cookies (and leave crumbs all over your new sherpa blanket), and loudly overpower everyone else's stories with tales of their own exploits (you ME, you ME, yo-ME, y-ME, ME, ME). They're not worth inviting to any get-together, small or large, because even after they leave you're stuck cleaning up the wreckage until the next time they come around. In life, if you're smart, you'll keep out the 'What if's." In story, if you're smart, you'll invite them in. Story loves to appeal to the imagination; good story will reach out to the reader (or viewer, or listener) and trigger the faint nudges, both the uneasy and the delighted whispers. A story that triggers the imagination is a story that pulls you in and carries you along, sparking your curiosity, and making you think and plan—story—along with it. A story that leaves nothing up to the imagination is like reading board meeting minutes: too long, too many details, and too boring. It doesn't leave any room for free space in the mind, for it to wander at will. Inviting imagination into your story is like inviting the 'What if's.' But surprisingly, in story form, they're quite docile; like the friend who always brings good wine to your dinner party, the colleague who tells you when there's spinach in your teeth before you make a presentation to the VP, and the driver in the front of a long line of cars who stops at the crosswalk to let you cross when you're carrying 5 large Bloomingdales bags. You want 'What if's' in your story. How do you invite them? #) Don't over-explain. One of the joys of writing story is that many times, people can relate to situations that you're describing—that means they're acting it out in their heads. If you describe every detail, they'll get tired of trying to stick to your over-demanding script, and they won't enjoy immersing themselves in the story. Bring nuance into your story, but don't describe every single blink and attitude. Fill in the big lines, but leave the little spaces blank, for the imagination to play with. #) Watch. One of the best ways to learn to write good nuance is to observe social interaction (this absolutely is not an excuse to be creepy). Watch people talk to each other. Watch them greet. Watch them say goodbye. Watch them fight, make up, make decisions, make shallow conversation, make other people cry, make other people laugh, make gossip more interesting, make it boring, and make friends. Watch all of it, see what they do and how they do it, and practice describing it, with sparse language, but still a clear point. #) Practice. As always, the only way that you'll get better at something is if you do it all the time. Not once a week, not every third day, but every day. For more than just a minute or two. It's a commonly accepted theory that it takes 10,000 hours to become an expert at something. A bad storyteller could tell a crowd the most exciting news piece of the year (the breaking of a 108 'curse,' for instance), and put his audience to sleep. A good storyteller could talk about a trip to buy a package of napkins, and hold his audience's rapt attention. It isn't the story that makes the story good, worth reading, interesting; it's the storyteller. When he starts to tell a story, he resumes the responsibility to guide, to entertain, to make the audience feel like they didn't waste their time. In light of that responsibility, how do you become a better storyteller? #) Practice. It's the number one advice for getting better at everything. You don't get better unless you try. Trying takes time. Practice telling your story—develop your craft. Try different words different places, use bold expressions, make dramatic story-telling moves that you're scared of. Tell your story in the mirror. Tell it to your mom (and then someone who loves you a little less, for more critical feedback), tell it in the dark, tell it to the flock of birds at the pond. The more you do it, the better you'll be. #) Watch/read/listen to other people. It's hard to develop a craft well in complete solitude. The lucky thing about developing your art is that sharing is allowed. If someone else does something that you admire, that's completely brilliant, try it. Tweak it, change it, make it yours, but don't be afraid to grow by imitation. Other people come up with amazing strategies. Using them isn't wrong—it's like adding a tool to your tool-chest. #) Say what matters. In this busy, flustered, over-worked and under-rested society, people only want to listen to things that matter to them. If they don't see any reason to listen to what you're saying, they won't listen. Think about what people want to hear, think about what matters to them. They want to hear virtue, kindness, human triumph through herculean struggle. They want to hear stories that make them cry, or roar with laughter, stories that end with a warm feeling all over, or the bright resolve to be a change in the world, to make a difference. #) Pay attention to your audience. If they're not paying attention, or you're not getting any feedback, if 7 of the 12 people are sleeping, maybe it's time to reconsider how you're telling your story, and change things up. Being a storyteller is a privilege; being a good storyteller is a gift. Appreciate the privilege and the gift, and do your best to be better. The world could use more of those people (us). A long piece of writing is not automatically good, and a short piece isn't inevitably bad. It's about the preparation and the content. Instead of spending hours writing a lot, think careful about what you're writing. Practice writing less, better. See Seth Godin's blog for today. Yesterday was fall (the season is currently fall, but yesterday was especially fall-ey). It was brisk and overcast, and the leaves looked like a screensaver on a loop—they just kept falling. The wind smelled like the forecasted rain, as we drove across a half dozen Chicago neighborhoods during rush hour. We pulled up to a red light in our big fifteen-seater van full of college students. Because we sit higher than everyone else, even in the middle lane there was a clear view of the Boost Mobile store on the corner, and the blow-up, one of those tall stick men that waves his arms back and forth and flops both ways. While we were sitting at the light, a big guy (lots of ice cream kind of big, not lots of weight lifting) wearing a black shirt came out of the store. The shirt had printed on it the words "man of the hour." He slowly bent over and picked up the electrical cord at a joint between the black cord of the blow up guy and the orange extension cord. In his hand he had a piece of duct tape. It was about a foot long, and he was trying to put on the joint, probably to keep the joint dry in the coming rain. The wind was blowing it around and he kept trying to straighten it with his already full hand.He frowned and chewed his bottom lip. Then the light turned green, and I couldn't watch the end of the story. This is why we need writing. Writing is like the Instagram of the literate world. Writing is how you record the stories that you see all around you every day. The beautiful seconds, things both poignant and gentle, the moments that bring tears to your eyes and you're not sure why. A picture says a thousand words. But a thousand words can tell a story that brings delight to your heart, or puts a knot in your throat, or fills you with resolve to do bigger and better things. And we need those emotions. 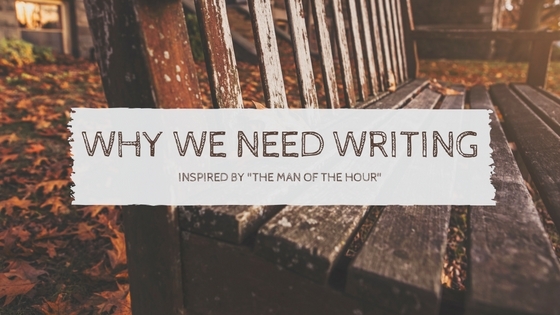 We need writing.